Not all comic book heroes wear capes. And some aren't what you might call "conventionally handsome," a la Superman and Peter Parker. But you probably already knew that if you like to read vintage horror comics... such as the cult favorite "Creepy," hosted by none other than Uncle Creepy. Like the Crypt Keeper, Alfred Hitchcock, and Rod Serling, Uncle Creepy is our charming, lovable guide through tales that might otherwise be too terrifying without a humorous host. In our (comic) book, this makes him one of the greatest heroes of them all. 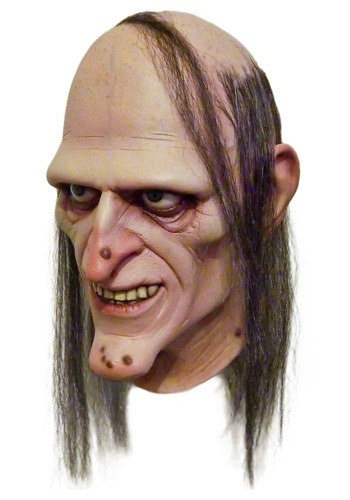 So this Halloween, dress up as a true icon with this Uncle Creepy Mask! Unnervingly realistic and highly detailed, this officially licensed mask is one that will instantly mark you as a horror comic connoisseur. Just pair it with a butler-style suit and a frilly jabot collar, and all your fellow horror hounds will recognize you as the one and only Uncle Creepy! Very nice quality with great detailing. Endless possibilities for terrorizing friends and family year round.